iGaming news | ICE Daily day one edition out now! ICE Daily day one edition out now! 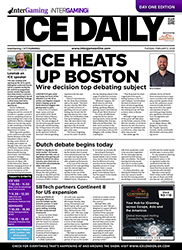 ICE 2019 kicks off today and of course the day’s breaking news will be carried in the industry’s leading show daily. The day one edition is now available in digital format, viewable directly from your smartphone, tablet, Mac or PC. The opening day’s edition leads with the situation in the US the upcoming ICE North America. It also features the latest on the discussion in the Dutch senate concerning the legalisation of igaming and the new partnership between SB Tech and Continent 8. Alongside this, you can get up to speed with all the usual details of show reveals and announcements from the gaming and igaming industry’s biggest players, such as: IGT, Novomatic, Konami, Golden Race and Yggdrasil.